Without context, Manchester’s newly developed Exchange Square might seem nothing more than the epitome of smart, anonymous, a-historic urban space. The screaming freshness of Metrolink yellow and the disorientating gleam of unworn pavement offer up little. But nowhere is without a past, particularly here, the site of the 1996 IRA bombing – an event still present in many people’s minds. As with so much of Narbi Price’s work, the shift in significance provided by this added layer of knowledge plays an important role in his latest series, Codeword (currently on display at PAPER). 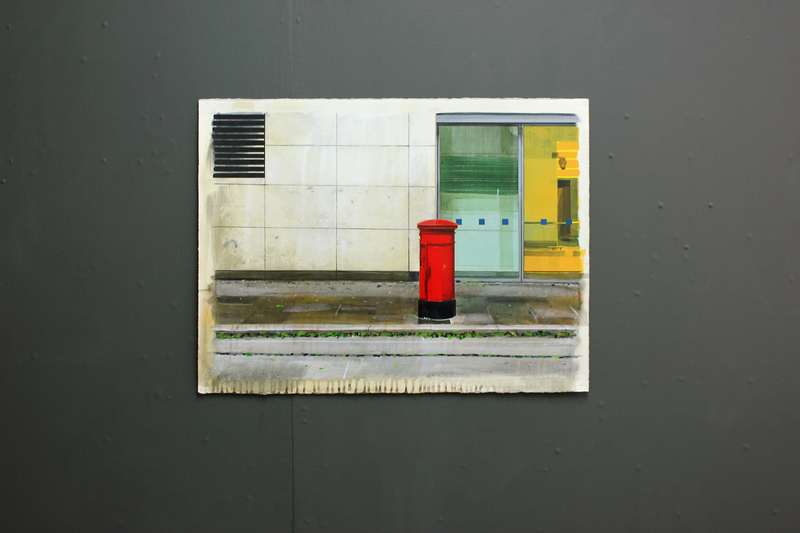 Comprised of just two paintings, both of the city as it is today; one shows a non-descript bench and the corner of a billboard ad, the other frames a red post box and the edge of the entrance to Selfridges. It turns out that the first view is the exact spot where the van carrying the bomb was parked, 20 years ago. The second is of the now legendary Royal Mail post box: one of the only objects to have withstood the blast (despite its positioning at the epicentre) and which is still in service today. Presented as part of the Manchester Histories Festival, the exhibition coincides neatly with the anniversary of the bombing. However, Price had been playing with the idea of making the paintings for some time. He was about 17-years-old when the explosion took place and, despite being from Hartlepool, already familiar with the city after making regular trips to see bands such as Deftones and Machine Head play. He describes his memories of discovering the news as ‘half-remembered and glimpsed’ – qualities that seem visible in both paintings. An artist who usually works on canvas, Price has embraced the medium of paper in a playful way: exploring the limitations provided by its flatness by creating a rough border to work within, and for the paint to stray and drip freely out of. This gives each piece a somewhat momentary appearance: destabilising the scene whilst simultaneously physicalising time through the visible process of paint drying. The approach is interesting given his choice of subject: a comparatively recent event that’s publicly remembered. Previously Price’s work has either been concerned with forgotten place histories, such as Shan’t Quit, which depicting the various non-descript, non-locations around London where the Jack the Ripper murders took place, giving new significance to sections of space you wouldn’t normally have looked at twice. Or private place histories, exploring the personal significance of a gutter or cement path, for example – spots where he was attacked one night on his way home. The ragged edges and heightened presence of the Codeword paintings seems to respond to this rawer choice of subject. Remarkably, the show was installed at PAPER on the same day as the bomb scare and evacuation at Old Trafford Football Stadium. Price reflects on how it wasn’t until the 1996 Manchester bombing – disrupting streets he’d walked – that the specter of IRA violence became real to him. The name for the show springs from his ongoing fascination with the unspecified code word that was used as a warning to evacuate the area before the explosion occurred (preventing any fatalities). Yet, as is characteristic of Price’s work, Codeword remains foremost a series of paintings about painting. While from a distance both pieces have a photographic appearance (the medium that Price begins with, as a form of documentation, and then paints from); up-close, large expanses collapse into more abstract experiments. The sliding glass door behind the violently red post box is represented by a Howard Hodgkin style thick brush of paint. The grubby wall in the background is a sea of loose, varied tones. The dark-green bench is more recognizably a trapezium, which sits awkwardly within the space of the painting, as if transposed from elsewhere. The unusual framing and subject matter of Price’s work developed out of a desire to challenge himself artistically through limitations. An encounter with his paintings inevitably also poses a challenge to the viewer; leaving us with a keenness to not only notice our surroundings, but be responsive to what other occurrences and stories they might have held. Codeworks is part of the Manchester Histories Festival (3 – 12 June) and will be on show at PAPER until 25 June 2016. Narbi Price is a Newcastle-based artist and a winner of the John Moores Painting Prize 2012. Find out more his work here.